NEW YORK, Mar 1 2015 (IPS) - Women in Bangladesh are carving healthier, wealthier futures for themselves and their children – and they have chicken eggs and pineapples to thank. 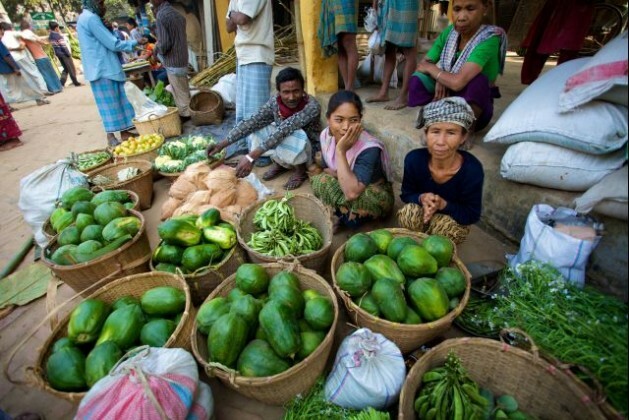 Since 2009, the non-profit group Helen Keller International has overseen programmes in the eastern Bangladesh region of Chittagong, mentoring women in agriculture to produce food not only for their own families, but also to sell at market. Kathy Spahn, president of HKI, said one-fifth of homes in Chittagong are considered hungry, while half the children are stunted and one-third are underweight due to poor nutrition. In the area HKI works, around 75 percent of people survive on just 12 dollars a month. “The area is stigmatised and has little access to health services,” Spahn said at an event this week organised by Women Advancing Microfinance New York. The programme, ‘Making Markets Work For Women,’ or M2W2, gives both initial start-up capital and ongoing guidance. 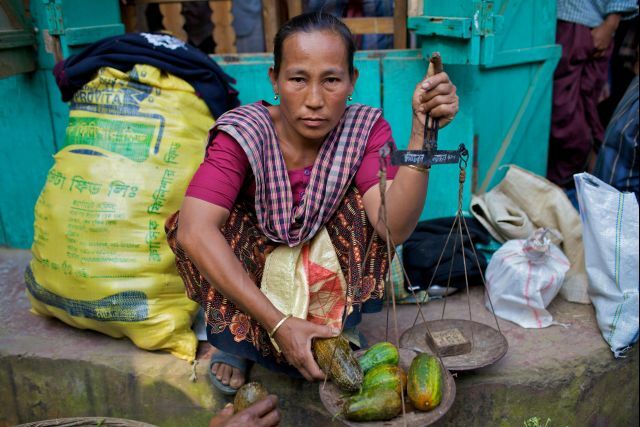 Women in Chittagong, who may have previously been viewed solely as homemakers, are given tools to grow nutrient-rich crops like spinach and carrots to feed their own families, as well as more lucrative crops like pineapple and maize to sell. Chickens are raised, eggs are eaten and sold, ginger and turmeric are harvested and refined and packaged using supplied machinery; and women who never before had any control over family finances are suddenly bringing in their own income to pay for education and healthcare. Helen Keller International – named for its founder, the inspirational deaf and blind author and activist – traditionally focused on sight and blindness projects, but today focuses on a broader gamut of health and nutrition issues, including blindness caused by Vitamin A deficiency. The group now runs 180 programmes in more than 20 Asian and African countries. “HKI has been working in Bangladesh since 1978, doing work on nutritional blindness. Doing nutrition surveillance there, we saw the deeper pockets of Vitamin A deficiency,” Spahn told IPS. Women organise themselves into small collectives, to better bargain and trade their produce. While each household may only produce an amount too small to make market sale effective, joining forces with other women means each collective has a larger volume to sell. “We want to build their capacity in business and marketing. We give them training on market research, demand, book-keeping, and organise the households into groups so they can aggregate their products,” Spahn said. A group savings scheme is also offered, whereby women can place some of their income into a shared pool that any member can access for large expenses such as hospitalisation or replacement of packaging machinery. “If something breaks down, we can’t replace it because that’s not sustainable. This is about development, not charity,” Spahn said. M2W2 was originally a three-year pilot programme from 2009 to 2012, but received an extra injection of funds from the British government to continue until January. “We are looking for more support to keep going,” Spahn said. The programme’s outcomes are resounding. Spahn said of the 2,500 households involved, “nearly all” saw a 30 percent increase in income. “When we started, everybody had a poor diet. Three years later, nobody did,” she said. Eggs, a rich source of Vitamin A, helped address deficiency of that vitamin and vision problems associated with such deficiencies, but Spahn said the most powerful benefit was social, rather than physical. “We found 90 percent of women had the sole decision over the money their raised. They were bargaining more efficiently, and feeling more empowered,” she said. Empowerment and financial independence for women is one of the ideological pillars of Women Advancing Microfinancing New York. WAMNY board member Danielle LeBlanc said the microfinancing and social entrepreneurship can be among the simplest and most effective ways to advance the economic prospects of disenfranchised women in poorer countries. “With an opportunity to earn income on their own, it helps women gain some independence and increase the financial sustainability of their families,” LeBlanc told IPS. LeBlanc said the term ‘microfinancing’ was a broad concept, viewed differently by many parties. She said governments consider it to be grants of under 50,000 dollars and that banks consider the threshold to be closer to 250,000, but LeBlanc said vast progress can be made with an initial outlay of as little as a few hundred dollars. “In the U.S., microfinancing might help out street vendors like in New York City, or to fund home daycare centres, or even small businesses with shopfronts. Overseas, we can be talking about the very poor, like women selling goods by the roadside, farmers, or craft makers,” she said. LeBlanc said the increase standing of women in the eyes of their husbands and their community is one of the most important benefits that such projects can offer. “It changes from community to community, but when women start bringing income into their family, it increases their confidence and they move from being totally dependant on their husband to someone bringing income into the house,” she said. She said the M2W2 programme was selected for presentation at the WAMNY event on Tuesday because of its “holistic” approach to empowering women, benefiting families, and changing communities. At its core, M2W2 is a simple one – give seeds and tools to women, show them how to farm, and teach them how to sell their produce. But both Spahn and LeBlanc said that, in the field of microfinance, often the simplest ideas can have the most impressive outcomes. “The key to whether a programme is successful isn’t necessarily the budget, it’s about whether it is based on a need. It needs clear communication with the community, if it is a programme they like and can use,” LeBlanc said. Spahn said HKI is currently working on a project in African countries including Mozambique and Burkina Faso, helping women there to grow sweet potatoes to make into chips, bread and cookies – again, both to sell and to feed to their own families. “We’ve always said, we should aim for complex problems and simple solutions. We want to take a problem apart, and find a solution that isn’t overwhelming,” Spahn said. Spahn said HKI hopes to institute the M2W2 programme in other other countries.